Helium is one of the best-suited choices to find the leaks because it is non-toxic, inert, non-condensable, non-flammable and is present in the atmosphere in the trace amounts (5 ppm). Since the atomic size of the helium is small it easily passes through the leaks. Hydrogen is the only molecule smaller than helium. Hydrogen is not used in leak detection because it is not inert. The next inert gas is neon, it is more expensive than helium and also heavier. Helium is not just inexpensive but is also available in the variously sized cylinder and its pure form is easily found. 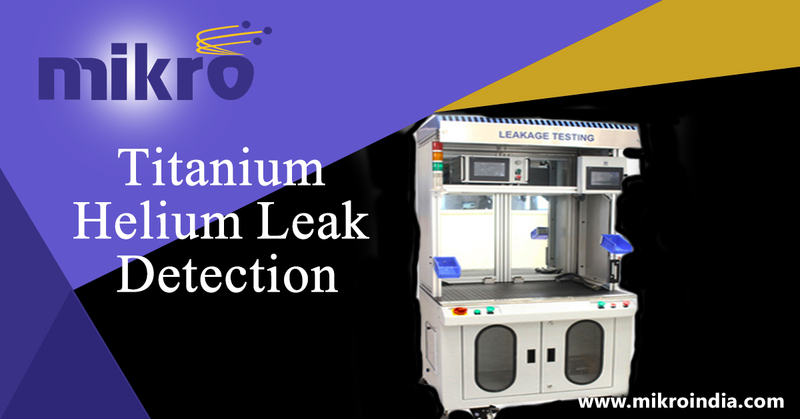 There are many other leak detection methods but none of them is as accurate as a helium leak detection method in terms of localization and quantification. The principle of the HLD is based on field mass spectrometer. The electron beam ionizes the leaked helium gas from the filament within the ion chamber of the analyzing tube. The added voltage accelerates the ions shifting them out through the slit. The ions then pass through the magnetic field generated by the analyzer. The circular trajectories of the ions depend on their mass, therefore the collector can catch only the helium ions and detect the helium. By using the special detector ion current is converted into an electric current. Utilizing the leak detection units this current is accelerated and displayed on the screen. The current measured is directly proportional to the helium concentration, therefore, is equal to the measured leak. Every step of the measuring cycle is controlled by the control system and valves, from the evacuation to testing to venting. Rotary and vacuum pumps are used to sufficiently maintain the low pressure in the spectrometer. Fixtures, that connects the unit to be tested with the detector. 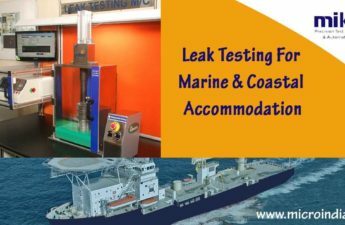 One must choose the testing method according to the working condition of the part to be tested. 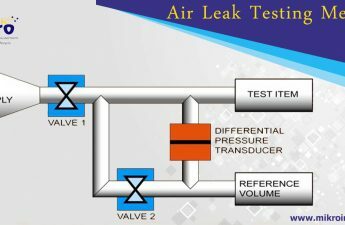 Maintaining the same pressure condition during the test as it is exposed to during its actual work is extremely important. Vacuum systems must be thoroughly tested with a vacuum inside the chamber. A compressed air system must be examined with high pressure inside the system. A sniffer-probe mode – In this test, the tracer gas is filled in the TP and the exterior is examined with a probe that is attached to the inlet of the leak detector. The probe constantly admits the air directly surrounding the TP. The tracer gas is filled in the TP and is kept in a test fixture that is eventually evacuated. Whatever gas flows out through the leak is captured in the volume surrounding the TP. 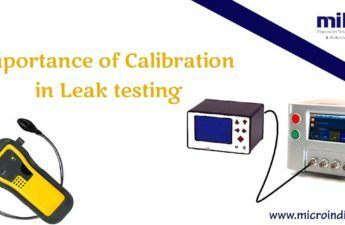 Leak detector analyzes the content of the volume as the representative of the total leakage. Vacuum Testing (Outside-in) can also be carried out in two ways depending on the TP. Leak tester directly evacuates the Test Piece. If the test piece is huge in volume is additional evacuated by the separate vacuum pump. A gas gun spray is discretely used to spray the helium gas on the suspected leak sites in the spray-probe mode. If any leak is evidenced when the Helium gas flows through the leaks of the evacuated TP and is detected by the leak tester. The TP is placed in the volume containing Helium gas that flows through all the leaks to the interior of the TP, where it is detected.